CBD-Hábitat runs a conservation program to reestablish monk seal populations in Mauritania and to sensitize local population about their preservation. The Parques Reunidos Foundation collaborates with CBD-Hábitat Foundation in carrying out its conservation program of this species in the Cabo Blanco peninsula in Mauritania. The work also includes efforts of education and sensitizations about these animals at all zoos and aquariums owned by Parques Reunidos. Through this program, the oldest and most established of the programs in which the Foundation participates, has contributed to significantly increasing the monk seal population. The colony at Cabo Blanco has gone from around one hundred specimens in 1998 to more than 330 nowadays, which represents half of the world’s population. Since May 2018, Faunia has hosted the “Return of the Monk Seal” exhibit (which was inaugurated by Queen Sofia of Spain) as part of the actions that the Parques Reunidos Foundation promotes to raise awareness about the need to fight for threatened species. The Mediterranean Monk Seal (Monachus monachus) is one of the most threatened marine mammals on our planet. Only around 600 individuals remain distributed in three different colonies: one in the eastern Mediterranean (Greece and Turkey) and two in the Atlantic (one in Madeira and another one at the western coast of the Cabo Blanco peninsula, in Mauritania and Morocco). Along the Hawaiian Monk Seal, they are the only seal species who live in tropical waters and they bear the closest resemblance with the common ancestor from which all other current seal evolved fifteen million years ago. This fact turns the Monk Seal into a true living fossil who faces quite an uncertain future. Until a few decades ago, monk seals could be often spotted near the costs of the Mediterranean and the European and African Atlantic. Yet, several factors have caused a critical situation for these animals in the last few years: random hunting practices they are subject to, accidental captures through specific fishing techniques, fishing overuse, marine pollution, and the destruction and invasion of coastlines due to massified tourism. The Cabo Blanco peninsula currently harbors the biggest Monk Seal colony in the world. 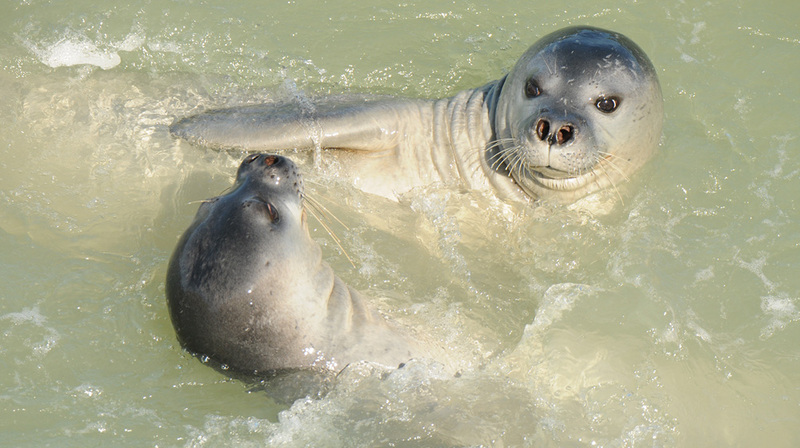 CBD-Hábitat, a Spanish foundation for the preservation of wildlife, started their work in Mauritania in 2000 through the Monk Seal Conservation Program. One year later they managed to create the “Costa de las focas” Maritime and Terrestrial Reservation in collaboration with traditional fishermen and the Mauritanian authorities. This reservation is a sanctuary for the species whose aim is to protect the colony on land and at sea. After almost two decades of hard work, the Monk Seal Conservation Programs has developed protection measures, it has been monitoring the population and has carried out many social and educational actions. So far, the Program has allowed an increase in the population from 100 to over 330 individuals, reaching up to three times more births every year. This positive news is nothing but an encouragement to keep up the good work in protecting the Monk Seal. The Parques Reunidos Foundation Works with Fundación CBD-Hábitat to promote their program to protect Monk Seals at all the group’s animal parks in Spain and Europe. Our objective it to make the Monk Seal more known to the visitors. The colony settled off the coast of Mauritania represents a great hope for the species, which, thanks to the Parques Reunidos Foundation’s support and CBD-Hábitat’s efforts, has been recovering since 2010. The Parques Reunidos Foundation provides constant technical support to the colony’s monitoring team from Madrid and Noadhibou. It also provides financial support through donations made by visitors and direct contributions from different parks in the group like Zoo-Aquarium de Madrid, Faunia, Selwo Marina, Selwo Aventura, Aquopolis Costa Daurada, Marineland Antibes, Blackpool Zoo, Lakes Aquarium and Bournemouth Oceanarium. The Foundation has contributed a total sum of 140.000€ to this day in annual donations of 25.000€. The Spanish and Mauritanian ministries for the environment also collaborate in the project and have proposed relocating some individuals from the colony at Cabo Blanco to the Canary Islands. Expert biologists and veterinarians from the Foundation would provide technical support throughout this operation. In addition to all the work and conservation efforts mentioned above, an exhibit called “El Regreso de la Foca Monje” (“The Monk Seal’s Return”) has been rotating at all the group’s animal parks (Zoo Aquarium de Madrid, Faunia, Blackpool and Marineland) to show the work CBD-Hábitat has done in Mauritania.